It’s hard to believe the Asia-Pacific Amateur turns 10 years old this year, at least until you begin to look at the past champions list. A 19-year-old Hideki Matsuyama, who now has 14 professional victories worldwide to his credit, won for the first time in 2010 in his native Japan before defending his title in Singapore the following year. Matsuyama earned back-to-back Masters invitations for his efforts. As a professional, Matsuyama has finished in the top 20 at Augusta for the past four years. It seems safe to say that the tournament, jointly developed in 2009 by the Asia Pacific Golf Confederation, the Masters and the R&A -- has taken hold in the Asia-Pacific region of the world and performed its intended job of identifying the next great talents from the region as well as bringing new players into the game. The Masters, afterall, is one heck of a carrot. The winner also gains entry into the Open Championship. For the first time since Matsuyama’s 2011 victory, the Asia-Pacific Amateur returns to Singapore. The 2018 tournament will be played Oct. 4-7 at Sentosa Golf Club, which earlier this year hosted the inaugural Women’s Asia-Pacific Amateur. SENTOSA HAS TEETH: Host Sentosa Golf Club will play to a par 70 for the Asia-Pacific Amateur instead of its normal par 72. Nos. 8 and 13 (see flyovers below) will be set up as long par 4s instead of par 5s. Andrew Johnston, general manager and the director of agronomy at Sentosa, named the greens as the course’s biggest challenges. A lower par will “put the teeth into” the championship. The winner will be a player who can think his way around the course. THE COMPETITION WILL BE TELEVISED: The Asia-Pacific Amateur has the distinction of being the most televised amateur golf tournament in the world. It will be broadcast in more than 160 countries this week. 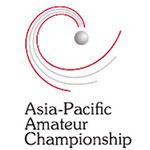 WHO YOU’RE WATCHING: The 120-man Asia-Pacific Amateur field is filled by invitation, the first of which are sent to the top players from the 41 Asia-Pacific Golf Federation-affiliated organizations. Each of those organizations can send their two highest-ranked players in the Official World Golf Ranking. If there is only one player – or no players — from a member organization in the WAGR, a member organization is able to nominate one or two players accordingly, as long as the player has a handicap of 5.4 or less. The rest of the field is filled by taking the next highest ranked players from the WAGR with the maximum number of players allowed from any organization being six. The only exception is for the host country, which is allowed to nominate an additional four players. This week, Australia will field six players, and so will China, India, Japan, Korea, Malaysia, New Zealand and Thailand. The maximum eight Singapore players will also play. China has claimed the most winners in the last 10 years, with Lin Yuxin last year becoming the third Chinese player to win the title. Two Australians have won, and of course Matsuyama won twice for Japan. Andy Zhang, China: Zhang played for the University of Florida for the past two years, but did not return to Gainesville this fall. Zhang closed his sophomore campaign in the spring with back-to-back individual victories at the SEC Championship and NCAA Kissimmee Regional. Zhang finished runner-up at this event a year ago, narrowly missing the spoils that come with victory. Min Woo Lee: Lee, 20, is the younger brother of LPGA tour winner Minjee Lee. The Australian, at No. 9 in the WAGR, enters as the top-ranked player and consequently, a considerable favorite. He is No. 6 in the Golfweek/AmateurGolf.com Rankings. His recent play reflects those rankings, too. Lee was T-6 individually at the World Amateur Team Championship last month, made match play at the Western Amateur, was seventh at the Sahalee Players Championship and won the South Australia Amateur Classic. K.K. Limbhasut: A red-shirt senior at the University of California, Limbhasut became the first Cal player to compete in the Asia-Pacific Amateur when he made his debut in 2015. Limbhasut, who will represent Thailand at Sentosa Golf Club, won twice for the Bears last year. He red-shirted the previous season to focus on gaining entry to the Haas School of Business, and also did not play the Asia-Pacific Amateur. He was seventh at the 2016 event. Daniel Hillier: You might recognize Hillier’s name from the U.S. Amateur, where he was a stroke-play co-medalist with Texas freshman Cole Hammer. Hillier won the New Zealand Amateur in his home country last year, and had top-10 finishes this year at the European Amateur and Players Amateur. He was one place out of match play at the Western Amateur, and finished T-12 at the Pacific Coast Amateur.